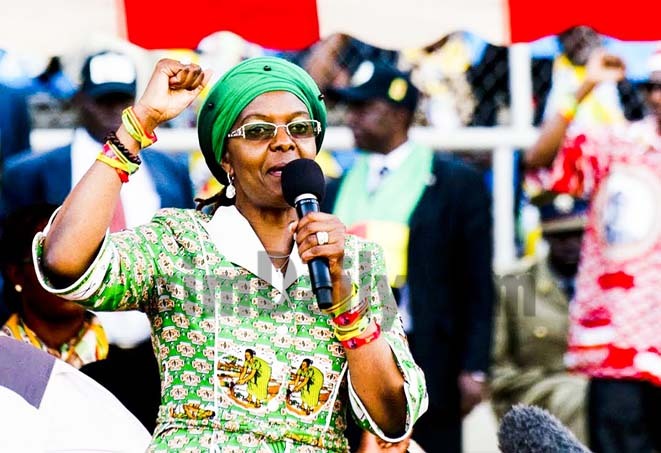 ZIMBABWE – Zanu PF supporters loyal to First Lady Grace Mugabe and Vice President Emmerson Mnangagwa fought running battles against each other at the Heroes Acre during the burial of former minister Sikhanyiso Ndlovu. On Saturday supporters of the First Lady went to the national shrine wearing t-shirts emblazoned with pictures of the late Vice-President Joshua Nkomo and President Robert Mugabe in front, while at the back they had messages praising Grace Mugabe. “The unity that shall never collapse. Munhu wese kuna Amai [Everybody should support the mother], was the message printed at the back of the t-shirts. The use of Nkomo’s picture was aimed at Mnangagwa who recently caused a storm after claiming that the late Rhodesian Prime Minister Ian Smith once told Mugabe that Nkomo and other nationalists lost the 1980 elections because they represented white interests. According to reports Mnangagwa’s supporters physically manhandled those who were wearing the t-shirts, including members of the Mbare Chimurenga Choir. Its thought Mnangagwa and Grace are now slugging it out to succeed Mugabe when he leaves office. Ndlovu (78) died in Bulawayo on Tuesday after suffering a stroke and an asthma attack. During the burial which was poorly attended, Mugabe (91) showed his age, slowly walking on the podium with the help of his wife, Grace. The Zanu PF leader avoided his usual tirades against the West and members of the opposition. His speech focussed on the achievements of Ndlovu.